As children grow and develop, exercise is vital in keeping their mind’s sharp and agile. 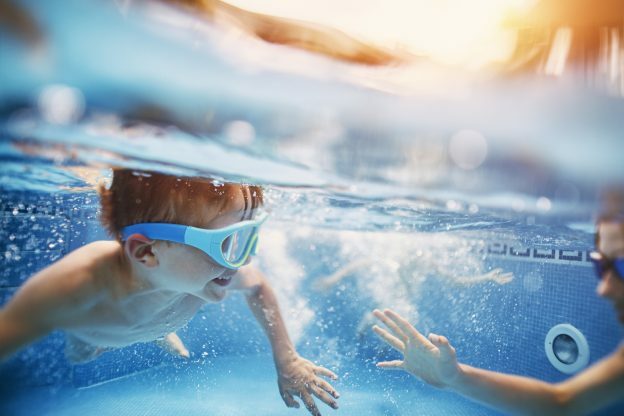 Swimming is a great form of exercise for children that can provide them with these types of positive mental benefits for their developing brains. So, while swimming is amazing for a child’s physical health, it’s also extremely important for their mental health as well. We’ve put together 4 benefits that swimming can have on your child’s mind! The benefits that exercise, in this case swimming, can have on a developing brain are very important. Some of the benefits include boosting levels of a brain substance that allows for the growth of cells and helping to create new neurons. Studies also indicate that fit children tend to have greater brain volume in the hippocampus, a brain region associated with memory, helping a child’s ability for long-term retention. Swimming is a great way for children to meet other children and have engaging social interactions. It provides them with a place to interact with others who often share similar interests and lifestyles. This not only helps them develop valuable friendships, but also their ability to socialize with individuals and interact with others besides only those who they see daily at school. Getting in the water, overcoming fears, and achieving goals are all part of what makes swimming a huge confidence booster for kids! All of these aspects of swimming can help children become confident in their abilities and see what they can achieve when they put their mind to it. The boost they will see in their self-esteem can help provide them with a positive mental outlook that will benefit them not only in the pool, but in the classroom, other sports, and their daily life! Even though it may seem like children are immune to stress, they’re still susceptible to a clouded mind that can dampen their mood. Swimming can help increase endorphins and mood-boosting chemicals in the brain, helping children to clear their mind and live a stress-free lifestyle.